Hermes with Gift, is Dawn Wood's new poetry collection, published by The University of Abertay Press. 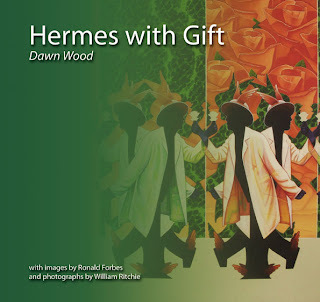 Cover image is by the Scottish artist Ronald Forbes, whose work is currently showing at Perth Museum and Art Gallery (until 15th October). .and is also for sale at Perth Museum and Art Gallery. overlaid and sleek, so it is with atoms. plain and overlaid with only void. the spur of a rose, a greener field.